3-in-1 Step 'n Ride Lion is rated 4.5 out of 5 by 30. Who’s the king of the kiddo jungle? Made for both little babies and waddling toddlers, the Bright Starts 3-in-1 Step ’n Ride Lion is perfect for sitting, scooting, pushing and playing! Show your little zookeeper how to sit and feed the brightly colored balls into the hungry lion’s mouth. Pop open the little flap along the lion’s belly to begin the fun again! Try a pat on the nose to hear roars of laughter as the colorful balls spin around and around the lion’s mane. When baby graduates from sit-and-play, the baby toy transforms into a walker toy! Watch him push the lion all around as the balls spin up a fit of laughter, and the movement activates melodies and fun sounds. When he’s ready for the ride of his life, the lion converts into a ride-along toy. With every scoot he’ll squeal with laugher, and be careful – baby’s belly laughs are contagious! Your little party animal will take you on three wild rides of non-stop fun! Get ready to roar with laughter! Dimension (in) 12" x 16.5" x 20"
Rated 5 out of 5 by Gramma from Baby loves it This was a gift and he loves it...enjoys it almost daily!! 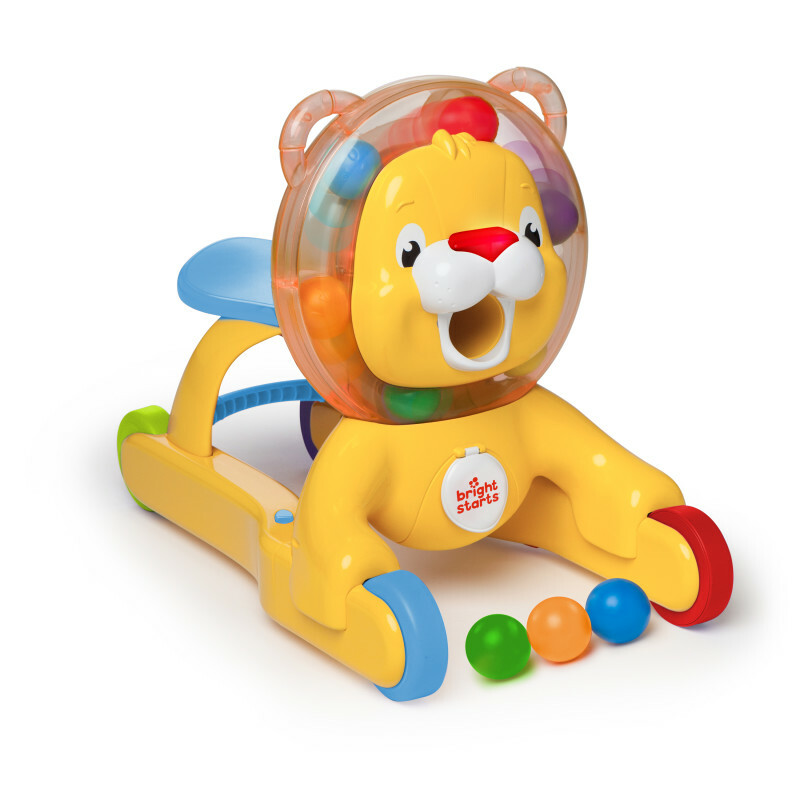 Rated 5 out of 5 by 4649miranda from Eye-Catching Musical Fun The Step & Ride Lion is brightly colored and eye-catching. The music and balls is fun for all ages. (Even our 4, 7, and 9 year olds can't stop pushing the button!) He's cute and a great addition to any child's play. *I received a sample in exchange for an honest blog review. Rated 5 out of 5 by astewart0120 from Great toy all around I received this a few months ago to test this product.My 18 month old child absolutely enjoyed this toy more than ever he had anything else.NOt only did he have fun playing with it but it also taught him a lot such as helped him to take his first steps!!!! Rated 5 out of 5 by heather from Awesome Walker/Ride on Toy I was sent this in the mail and I was so excited to get it and try it out on my Toddlers and I was not surprised that they absolutely love it! With dual usage as a walker and ride on and the fact it makes lion noises are great features. The seat is a nice size for there little behinds and no chance of slipping off of it. This is one of best toys in my house and will continue to get used.I highly recommend anything but especially this toy from Bright Starts! Rated 5 out of 5 by CrazylifeofMomE from What a fabulous toy to grow with! We were given the chance to test this toy out for Bright Starts! The package itself was brightly colored and exciting! Putting together Mr. Lion was a breeze! Easy instructions and just needed a screwdriver! What an amazing toy! My 6 month old little man loved the colors, lights, and sounds of this cute Lion! When you push his nose or ride/push the lion it comes to life with balls spinning around the mane and by putting the 3 brightly colored balls (included) into the mouth he shoots them out and provides loads of laughter! Don't worry moms the flap they come out closes which makes a great place for balls to be stored! Riding on the lion is another adventure as he glides across the floor playing sounds as the mane spins around! We aren't walking yet but when we do we can't wait to push Lion around the transformation to walk behind is easy and locks into place the legs widen out to provide plenty of baby walking room! OH and moms don't worry there is an off switch so baby can play without the noise! Although I cannot guarantee there won't be squeals of joy coming from baby! Great toy!! I was not paid by Bright Starts for this review...I am a mom to 4 girls ages 12, 11, 9, and 5 and one little prince who is 6 months old!